This cake is garnished with fresh cream, pineapple, cherries, and creamy floral designs. 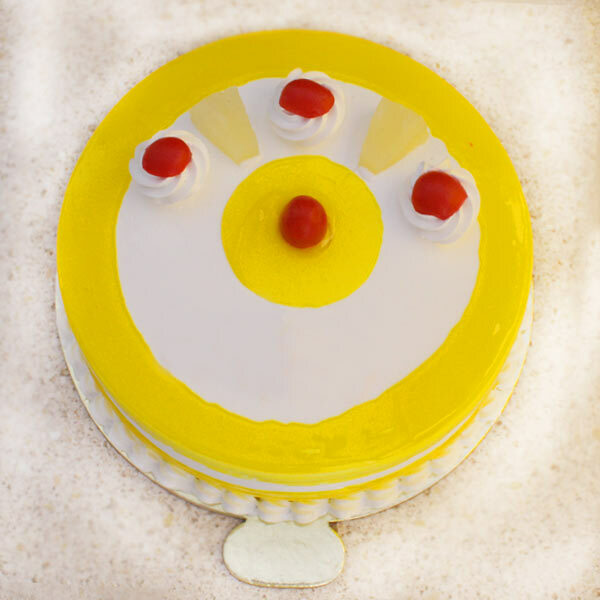 The designing of the cake may vary a little from the image shown. The decoration items, cake stand, and other accessories used in the image are just taken in use for representation purpose. These won’t be delivered with the cake. The classic Pineapple cake is favorite of many in majority. So if you are also the one in love with the delectable sweet taste of pineapple cake then here for you is this delicious 1/2 kg pineapple Cake. It is yummy cake with beautiful creamy, pineapple and cherry toppings. Apart from the creamy frosting with pineapples and cherries on top of the cake, the key ingredients used in making of this cake are flour, powdered sugar, butter, pineapple juice, vanilla essence, baking powder, eggs, and more. You can also avail the eggless version of this black forest cake if you are a vegetarian.